Initially, every HPSDR/Hermes/Angelia and Orion MK1 was using a combination of lpf and hpf triggered by the famous “J16” in the “Hermes Control” tab. Choosing the right lpf and hpf was giving each user the ability to configure any bandwidth bpf filter. -	With this bpf architecture, I imagine that the TX Path LPF is not in use during RX (or does-it, to enhance the upper cutoff slope of the filter ?) Am I right ? -	Is there any technical reason (except cost & switching simplicity) to adopt a bpf topology instead of the Alex architecture ? The TX LPFs are completely independent of the RX BPFs. Yes, there are bypass paths provided. 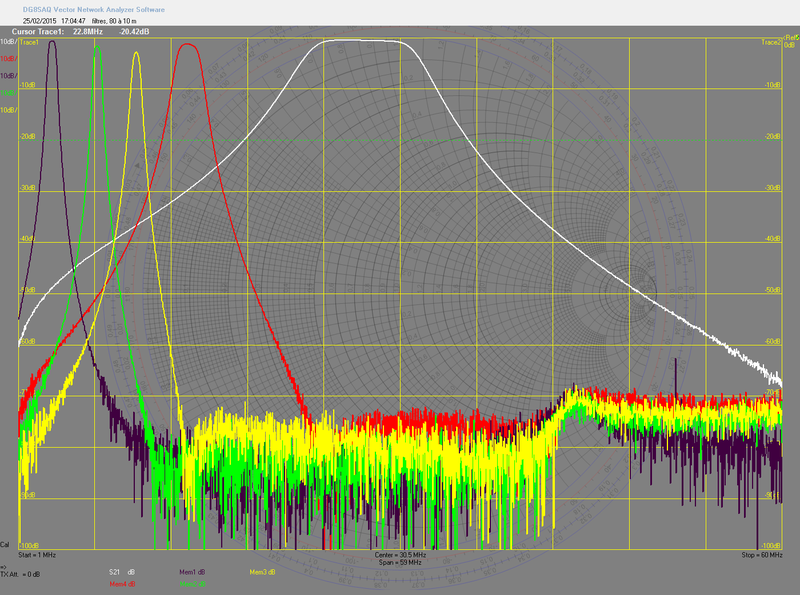 These two frequencies define when that particular filter combination will be selected. With the RX tuned to any frequency between those two then the corresponding filter pair will be in line. This provides for some flexibility when using non-standard filter hardware, as indeed a homebrew radio might do. The 100D and 200D do not have any filtering at all on the RX2 path (when RX2 is assigned to ADC2). Note that the "RX2" connector on the back panel leads to ADC2. Since RX2 can be assigned to either ADC1 or ADC2 this often does cause some confusion. Not really. It all comes down to cost. More preselector options are better and more flexible than less. Many aspects of the architecture are crystal-clear now. Anyhow, BPF or Alex filtering, i'll try to design the same kind of filter for both ADC. That means if I decide to use the Alex configuration, I'll have to build a dedicated hpf and lpf board... and that's a lot of work, simulation and VNA tests. pbf option is far simpler but is probably not covered by the open hardware licence of the TAPR... I don't intend to mess with Abi's intellectual property. Before you go building everything from scratch, you might take a look at the various offerings available from http://eb104.ru/. 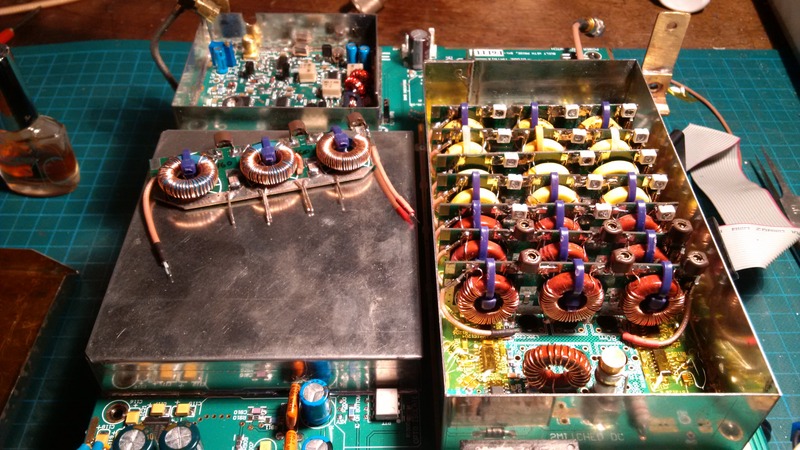 Many people have used their products to build their own custom Hermes/Angelia/Orion-based radios. I myself used one of their BPF boards to build my own RX2 preselector. I almost know their web site by heart UA3QLC is a nice guy and a good technical person. And I’m pretty sure one day I’ll build his 1200 W SSPA with all the protection bells and whistle. On the other hand, I've tested his diplexer filter.... could be better compared with a WB6DHW (himself inspired by WM5Z http://www.qsl.net/wm5z/qex199907.pdf ). The one I had in my hands was really badly tuned. I must confess, I love building stuff, I hate building “kits”, and I hate more using boards ready to use, tuned and trimmed by others. Even when a filter has been designed by "people who knows", I try to find a better design (for example my Picastar bpf RX frontend https://wiki.electrolab.fr/images/9/9b/Bpf_montes.jpg). A ham project without learning something or "building"something (from EDA to VNA ) is not my cup of tea. Probably because I'm definitely not a real technical guy...people who have your skill have less to prove to themselves and less time to lose to reinvent the wheel. Particularly when they are spending so much time helping other hams like you do. It’s also probably a reaction to the general “consumerism trend” that slowly kills ham radio. When most of the threads you read on a mailing list consist to compare two microphones or speak about some gadget included in the last YaeICoWood, you really need to “do” something of your own. And try to convince other hams to do the same. Anyhow, about these filter questions, I should say that I’m living in a very quiet area from an RF point of view, lost in the middle of the French Alps. Industrial noise level is low (some electrical fences when cows are outside in the valley, 2 months per year), far away from any big broadcast station. Thus, filtering is just an option. I can only measure a very small (3 to 5 dB) variation of the noise floor with and without filter (test made with 7th order Tcheb, 80 dB average rejection https://wiki.electrolab.fr/images/7/76/ ... ndants.png ) using several SDR. I’ll probably change my mind with my Angelia, as my “best” SDR right now has only a 14 bits ADC. Thank you for your help and advice, Scott. I’ll keep you informed if I build a dual Alex-like board of a classical bpf filter.